How and why infected baby teeth are saved! Examination begins with a thorough medical history; a child with systemic (general) disease may need different treatment than a healthy one, and the dentist must consider any implications of the child's condition related to root canal treatment. The characteristics of pain in a primary tooth are particularly relevant in helping to determine the status of the pulp. In the absence of trauma, pain is most often due to tooth decay reaching the pulp, which contains the nerves within the teeth. 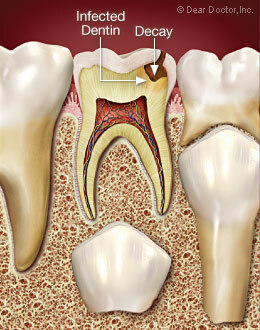 This illustration shows a cross section of a healthy tooth and pulp tissue (nerve tissue) with no tooth decay. 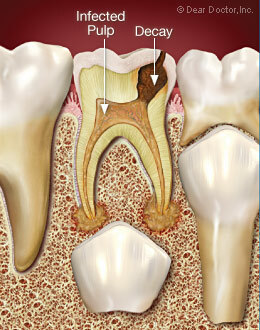 Decay is progressing beyond the protective enamel surface of the tooth. Notice how the decay spreads once it extends beyond the enamel surface. When the decay enters the pulp tissue, it becomes infected. 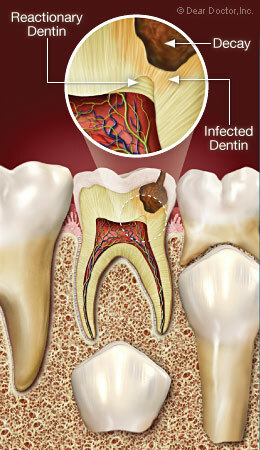 This infection could damage the permanent tooth if left untreated. Symptoms of pain usually accompany pulpal inflammation. However, extensive problems may arise without any history of pain. If possible, a distinction should be determined regarding whether the pain is spontaneous or only occurs when provoked; pain that ceases after removal of the cause is usually reversible and indicative of minor inflammatory change. Pain-provoking stimuli include: thermal, hot and cold; chemical, caused by sweet or acidic foods or beverages; and mechanical irritation, biting, or wobbling a loose tooth. Other common causes include deep tooth decay, faulty restorations (fillings), soreness around a primary tooth that is loose and ready to fall out, or an erupting permanent tooth. Spontaneous (unprovoked) pain is characterized by constant or throbbing pain that occurs without stimulation and continues long after any causative factor has been removed. Spontaneous toothache is usually associated with extensive degeneration of the pulpal tissues extending into the root canals; this may be followed by swelling of the gum tissues and abscess formation as infection spreads beyond the roots of the teeth and into the surrounding bone. Radiographs (x-rays) of good quality are essential after the clinical examination. Like permanent teeth, areas of infection appear at the root ends of primary front teeth. In primary molars (back teeth), changes are also most often apparent in the furcations, the areas where roots join each other in multi-rooted teeth. In advanced cases of infection, and where the permanent tooth bud may be in jeopardy, removal of the primary tooth may be necessary. Mild but chronic pulpal irritation as seen in tooth decay might stimulate the pulp to deposit more dentin (the living tissue of which the body of the tooth is made). This “reactionary” dentin is nature's way of healing the tooth. When looking at radiographs of a child's primary tooth where tooth decay has reached the pulp, advanced pulpal degeneration occurs and extends into the root canals. Interpretation of radiographs of primary teeth is always complicated by the presence of new permanent teeth. Although all decay that penetrates into the pulp causes inflammation, the larger the penetration, the more likely it is to cause death of the pulp tissues. Pediatric dentists specialize in the treatment and management of children and adolescents, in growth and development of the teeth and oral structures, and they routinely treat root canal problems affecting primary (baby) teeth. They are particularly adept at figuring out what's wrong with primary teeth. Additionally, endodontists, who have had two to three years of additional training following dental school, specialize in the diagnosis and treatment of pulpal problems. General dentists who have taken additional training may also treat root canal problems of primary teeth. This additional training is important because there is not always a definitive correlation between symptoms and the state of the tissues of the tooth when dealing with primary teeth. Also, younger patients are often not the best historians and accurate reporters of problems. All of this complicates the diagnosis of pulp health and disease in primary teeth and in immature permanent teeth. Primary teeth with a history of spontaneous pain are generally candidates for more traditional root canal treatment or extraction. But outside of this situation, there are alternative pulp treatments to prolong the life of primary teeth so that they can perform their necessary functions until they are lost naturally. Another important factor to consider is the proximity of infected baby teeth to their permanent tooth successors. The treatment least likely to damage the permanent tooth should always be chosen. Infected permanent teeth in children may require special management due to problems associated with incomplete root development. Endodontists routinely treat these cases in children and should be included as part of the dental treatment team. Roughly half of traumatized primary teeth develop transient or permanent discoloration. These colors vary from yellow to dark grey and usually become evident one to three weeks after trauma. Primary teeth with yellow discoloration frequently have radiographic signs of root canal calcification, bone-like deposits that can completely obscure the pulp. Injured primary teeth with dark gray discoloration are reported to have necrotic (dead) tissue in their pulps in 50-80% of cases. Almost all pediatric dentists and endodontists agree that completely knocked out (avulsed) primary front (incisor) teeth should not be replanted because of the possibility of danger to the underlying permanent tooth buds.